Adjustable hospital beds have now been around for many years in a variety of forms, offering enhanced patient comfort and adaptability to a range of special conditions and treatments. However there are a number of types of adjustable bed that are available with differing features and levels of complexity. These different types of bed are more suited to some hospitals than others and so it is well worth considering acquisition costs, support and infrastructure costs and suitability to the individual requirement prior to acquiring adjustable hospital beds. 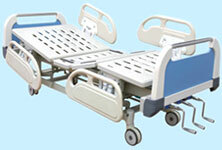 The gatch bed is the most basic form of all adjustable hospital beds and has been around for a great number of years. Its basic design means that it is especially well suited to hospitals which operate with low budgets or that are located in remote locations with little or no infrastructure. In such situations the main advantage over the majority of modern hospital beds is that there is no requirement for electricity. The gatch bed is raised and lowered using a series of three cranks which are located at the foot of the bed. One of these cranks raises and lowers the bed along its entire length, another raises and lowers the head of the bed and the final crank raises and lowers the foot of the bed. Although the gatch bed is very basic in nature, it is extremely effective in its function and greatly enhances patient comfort over flat beds. Adjustable hospital beds allow the position of the patient to be adjusted in order to maintain comfort over a period of days or even weeks. Furthermore, adjustable hospital beds allow patients experiencing specific conditions or treatments to be positioned in a way that suits the patient and their condition and ensures maximum comfort. Although nowhere near as advanced as an electric bed, the gatch bed provides vital levels of comfort for patients and is much superior to a non-adjustable equivalent. The electric bed offers huge advancements in patient comfort over basic adjustable hospital beds. Electric beds provide the patient with an electronic control panel which can be positioned anywhere within the bed or within close proximity. Using this control panel the patient can adjust the elevation of the whole bed or different areas of the bed and adjust the angle of different sections of the bed. All of this can be done at the touch of the button with the help of the electric motor located below the bed and rail system which the bed is mounted upon. Aside from the huge advantage of being able to adjust more areas of the bed and with greater accuracy, thus greatly increasing patient comfort, the electric bed also allows the patient to adjust the bed themselves rather than relying on healthcare professionals. So when considering acquiring adjustable hospital beds, consider the advantages and disadvantages of the gatch bed, the electric bed and the many other varieties of bed in relation to both cost and levels of patient comfort.